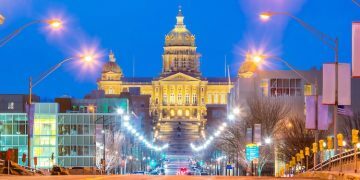 Iowa’s Committee on State Government filed a package of bills on Thursday that would legalize sports betting, but which bill advances will determine just what legal sports betting in Iowa will look like. Senate Study Bills 1079, 1080 and 1081 are Iowa’s first attempt at legalizing sports betting this session. SSB 1090 and 1081 are the most comprehensive of the three, but are at odds with one another. Though both allow for state-wide mobile, allow for betting on collegiate sports and name the Racing and Gaming Commission as the regulatory body, the similarities end there. SSB 1080 would require in-person mobile registration until 2021 and sets a 6.75 percent tax rate while SSB 1081 is a pro league-friendly bill that includes a o.25 percent “royalty” and allows the leagues to restrict or exclude certain wagers. The bill also appears to allow for stand-alone interactive sportsbooks, which have popped up elsewhere recently. 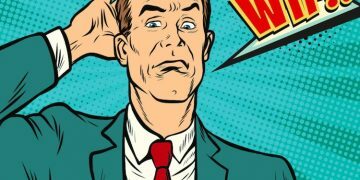 Washington, D.C. recently legalized sports betting with stand-alone mobile, and legislation in Virginia would allow for mobile without a brick-and-mortar component. 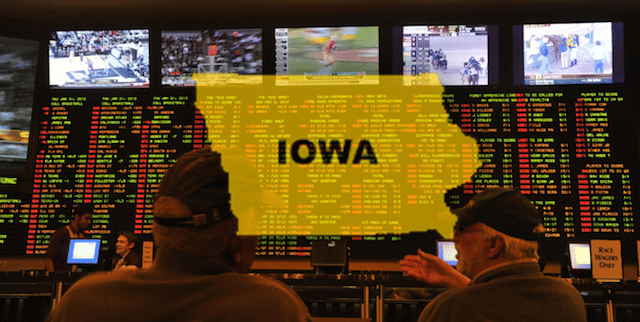 Iowa is bordered by four states that have legal sports betting on their minds, in particular, Missouri to the south and Illinois to the east. There are currently at least three sports betting bills circulating in Missouri. Iowa lawmakers considered sports betting in 2018, but no bill got out of committee. A new Missouri sports betting bill filed late this week is tied to video lottery terminals and would impose “royalty” fees of o.75 percent off-the-top of handle on operators, benefiting the professional sports leagues and the NCAA. It is the second Missouri bill to include a payout to the professional leagues. The other one calls for 1 percent cut to be paid to the professional leagues and NCAA. The royalty to the NCAA in the latest bill is highest in any proposed legislation anywhere in the country. SB 327 would allow sports betting on gambling boats and over the internet, and it appears that interactive gaming could stand alone without being tied to a brick-and-mortar venue. The bill is certainly league-friendly with the “royalty,” and further it allows the professional leagues to to restrict or exclude certain wagers and mandates that sportsbooks purchase official league data. The bill calls for a 6.25 percent tax on adjusted gross revenue. The state that indeed passes a bill with a payout to the leagues will be the first state to do so. Two North Dakota bills were discussed in the Judiciary Committee on Wednesday and at least one is likely headed to a vote. In North Dakota, no bill can be killed in committee, but the committee could choose to combine bills as the process moves forward. According to Representative Thomas Beadle, the committee was “receptive” to sports betting, but both he and Jason Dockter (R-District 7) expected it to be a tough sell. North Dakota, Beadle told Sports Handle last month is reluctant to expand gaming. Both bills are fairly light on regulatory details, and even tax rates, as the lawmakers chose instead to file broad-brush bills that would simply legalize sports betting and leave many of the particulars up to the Office of the Attorney General, which would be the regulatory body. The key difference between Beadle’s HB 1295 and Dockter’s HB 1254 is that Beadle’s bill would not allow for betting on college sports while Dockter’s would. Neither address mobile or interactive sports betting. Following the lead of the Deadwood Gaming Association, a pair of South Dakota lawmakers have filed SJR2, a bill that would put the question of legalizing sports betting on the 2020 ballot. According to the bill, state revenue from sports betting would be earmarked for historic restoration. South Dakota currently only has legal gaming in the tourist town of Deadwood and on tribal land, and sports betting would be limited to that area, as well. Mike Rodman, head of the Deadwood Gaming Association, told Sports Handle in December this his organization, which lobbied for a constitutional amendment, would like to see in-person wagering only and would like to see Las Vegas-style sportsbooks. Lawmakers like a Missouri bill that would help fund stadium repairs and maintenance, but gaming industry reps don’t. Afraid of being left behind, the D.C. Council continues its aggressive push to bypass bidding for a sports betting operator. On the DC/Intralot issue, has anyone done the math on this? How much money are they likely to realize by MAYBE speeding up entrance into the market? A couple of hundred thousand? Anything? Would anyone sue if they are successful? If so, they're upside down in a hurry. A New Hampshire bill would allow state-wide mobile sports betting, but wouldn’t allow betting on college events in the state. Sportsbooks headed for Super Bowl disaster? AGA: Americans will bet $6 billion on Super Bowl LIII. NY Senator Joseph Addabbo is picking up where John Bonacic left off, and is looking for creative ways to legalize sports betting. Dr. Lalia Mintas shares her insights on integrity in U.S. sports betting.